As accredited providers of the TTI Success Insight® Suite of Organisational Development tools, we can support you with a range of highly reliable, “multi-science” assessments. The TTI tools provide insights into human behaviours and motivations, giving you and your organisation a greater understanding of people when selecting, developing or managing both personal and professional lives. The application of these tools to workplace engagement and performance make them a highly practical investment into your people and business. Here is a sample of the tools we offer. Your consultant will help you consider the most appropriate assessment to meet your objectives. "Though we base 80% of our hiring decision on the technical - experience, skills, training and experience - 85% of turnover is due to BEHAVIOURAL incompatibility. That is, we hire people whose technical skills are sufficient but we fail to identify, measure or analyse the people skills required." 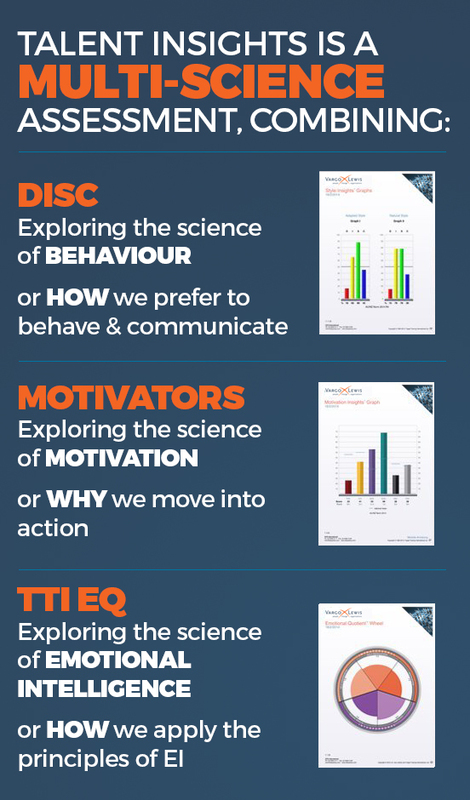 Art Schoeck, Corporate Behavioural Strategist & CEO, DataDome Inc.
As a multi-science tool, Trimetrix EQ skilfully integrates three key assessments to create an in-depth understanding of behaviour style, motivators (values) and emotional intelligence. This comprehensive tool can take coaching, training and development to the next level. This multi-science assessment integrates behaviours and workplace motivators, providing us with a more in-depth, comprehensive and useful tool. Talent Insights is an upgrade from the traditional single science DISC approach. Integrating emotional intelligence with behaviours (DISC), the TTI SI Behavioural Intelligence assessment takes EI one step further by creating an understanding how a person prefers to apply their emotional intelligence. While sessions on EI can be interesting, the integration of behaviours makes this approach a highly practical investment into actual performance. One of the most effective traits of a leader is emotional intelligence (EI). Multiple studies suggest that those leaders responsible for influencing, managing, negotiating and/or serving others are most successful when they demonstrate high EI. Our motivations are driven by our core values, yet as managers, we rarely use this powerful tool to support people to get the most out of themselves. Understanding alignment between a person’s motivations, their role and organisational values is key to productivity, engagement and retention. The management of productivity, attitudes and outcomes is most reliably measured by observable behaviour. DISC continues to be the preferred tool for measuring behaviour, estimated to be used by 75% of Fortune 500 companies. It is a simple, yet powerful way to understand a person’s preferred behaviour and communication style. What does Trimetrix EQ measure? DOES a person actively apply their emotional intelligence? This highly validated, 50+ page assessment produces a comprehensive report with critical information unique to the respondent’s behaviours, motivators and emotional intelligence. The ability to take action towards effective communication, professional growth and team development is greatly enhanced through this powerful combination of knowledge. What does talent insights measure? By understanding both preferred behavioural style and a person’s underlying motivations, or values, both the manager and the respondent gain deeper insights for highly practical applications. This highly validated assessment produces a 35+ page comprehensive report with critical information unique to the respondent’s behaviours, communication style and motivators. Talent Insights Coaching and Development Reports – Whether for general, sales or those in executive positions, we have versions of the report to suit. Each includes a comprehensive, user-friendly analysis of the person's behavioural style and motivators. Talent Insights Selection Profiles - A summarised version of the full report designed to provide hiring managers and recruitment professionals with what they need to understand a candidate's behavioural and motivational mix. Talent Insights Job Profiles – Also referred to as “Position Benchmarking”, this report provides a validated way to profile the unique positions in any business and determine the "ideal" mix of behaviours and motivators for a superior performer. Talent Insights Comparison and Gap Reports – This is a set of reports that visually displays personal reports against a benchmark (for example, in the selection process, to clarify how closely respondents match a benchmark). What does behavioural intelligence measure? The key benefit of integrating these two sciences is a more comprehensive assessment for coaching, training and supporting people to understand themselves and others, as well as to identify practical applications. This is critical to ensure tangible performance actions are the outcomes. As with all our reports, Behavioural Intelligence is well supported by research-based, validated and practical development activities. This 35+ page report provides useful insights and knowledge for achieving personal and organisational objectives. What does the emotional quotient assessment measure? Be aware of their own emotional states and the impact they have. Be aware of others' emotional states and the impact they have. Take action to manage or impact their own emotional states for the better. Take action to manage or impact others' emotional states for the better. The understanding of one’s emotional intelligence combined with the application of its principles contribute to key factors, such as: greater mental and physical health, increased job performance and more productive relationships. Empathy – How actively we observe others' emotional temperature. What does workplace motivators measure? Motivators (ways of valuing life) are the WHY behind our actions; they drive us to act in a certain way. Most importantly, our primary motivators shape the way each of us sees the world – at work and in life. Individualistic – A drive for uniqueness, status and to lead. Traditional – A drive for unity, order and a system for living. To extend the benefits of the Workplace Motivators assessment, consider the value of using one of our multi-science profiles. Research clearly indicates that without knowledge of a style analysis instrument, teams rarely reach their full potential. DISC is not a personality test or measure of intelligence. It simply measures what we can objectively manage in the workplace, observable behaviour, giving individuals and their teams greater insights for maximising strengths to achieve goals. Dominance – How we respond to problems & challenges. Influence – How we respond to people & contact. Steadiness – How we respond to pace & consistency. Compliance – How we respond to procedures & constraints. As a well-established tool, TTI Success Insights DISC leads the industry in validity and reliability. As a workplace tool, we can extend the benefits of DISC through what is known as, a multi-science approach. By combining the DISC profile with the Motivators assessment (known as Talent Insights), we understand not only HOW a person behaves but also, WHY they take action. 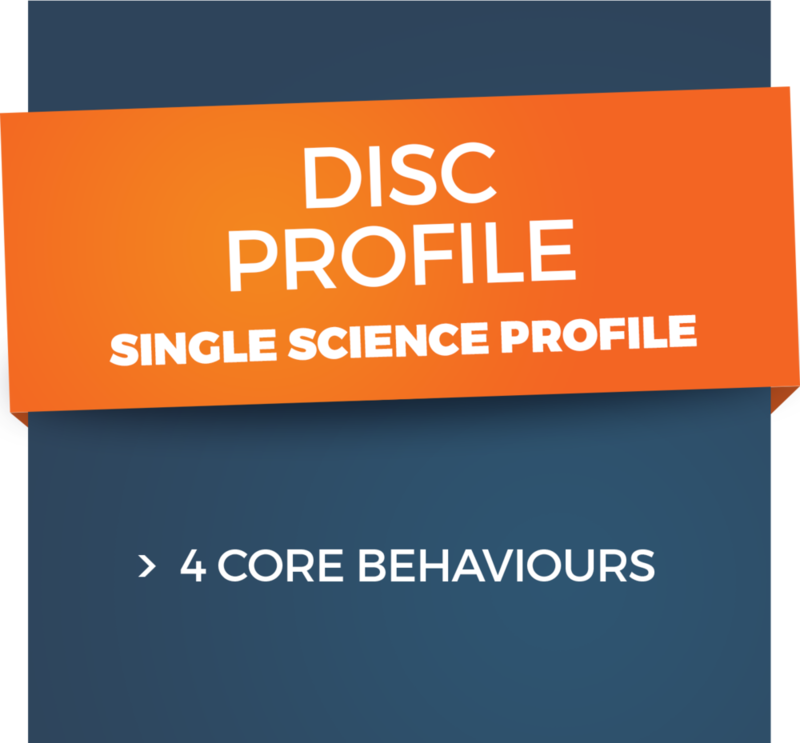 When people have similar DISC core styles, but behave differently, it is likely that their actual behaviour is being influenced by their motivators. The Talent Insights profile goes beyond the basic DISC, increasing the usefulness of the tool. Additionally, the TriMetrix EQ combines three assessments: behaviour style, workplace motivators and emotional intelligence, to gain an even greater perspective on an individual or team.